Still sunny with a dusting of snow in the high country. Dragging streamers and a variation of egg patterns over spawning beds just isn’t right. Midges if you can catch some shade or a wandering cloud. Royal Wulffs look like flying ants and Big Hole Crawlers work on the Big Hole River. 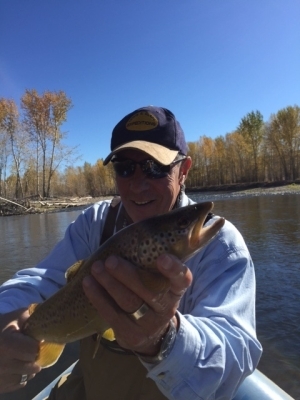 Healing Waters guest, Vince C. is holding a nice brown.